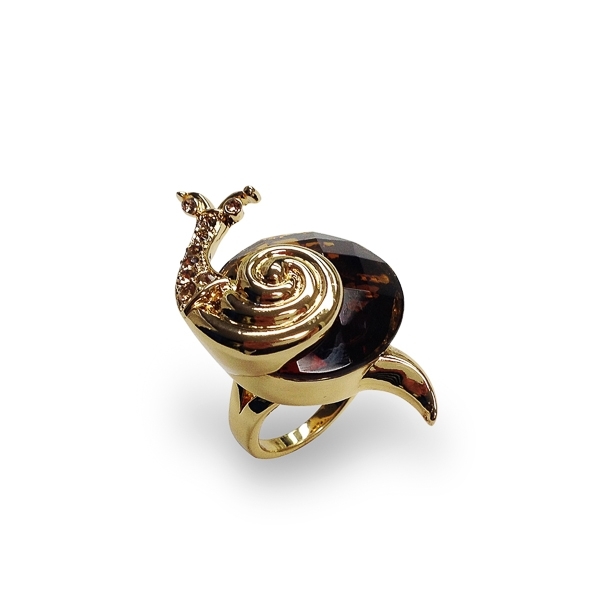 Description: 14k gold plated snail statement ring. Light topaz color crystals cover her slightly elevated neck, her body is a bold smoky topaz diamond cut glass stone, and her spiral back and tail are in shiny finish. She sits elegantly on the finger while you collect compliments. Material and Measurements: 14K Gold Plated Base Metal, Diamond Cut Glass Stone, Crystals - Focal Point 1" X 1 1/2"
Enter Quantity for R-AE047 to add to your shopping cart.